(PRLEAP.COM) REIA will host Todd Britsch, Regional Director of Metrostudy, at the REIA Main Meeting on February 12, 2018 to provide information on the State of the Puget Sound Real Estate Market. "Todd Britsch is a well informed speaker that REIA Members and Guests alike look forward to learning from every year" says REIA President Shirley Henderson. "Todd provides insightful information related to the market, both now and moving forward. Real estate investors who well utilize knowledge that Todd provides can achieve higher levels of success and profits and avoid market-related pitfalls that directly affect the bottom line." There is a high demand to hear Todd speak at REIA; registration at www.REIAwa.com is very strongly recommended to ensure seating. Real estate markets are always local and Todd is one of the best sources of information in our industry. Todd's company, Metrostudy, a Hanley Wood Company, maintains the nation's most comprehensive database of housing market information and is considered the definitive authority on the residential construction real estate and housing market. Metrostudy expertise runs the spectrum from local and national housing analysis, economic analysis and unparalleled insights into the housing market, commercial construction, real estate oriented consumer patterns and influencing factors for building product manufacturers. REIA of Washington is said to have one of the highest rates of successful real estate investors in the nation, in some part a result of Todd Britsch and other extraordinarily well informed speakers. REIA speakers are REIA Business Members, local professionals who are experts in their fields, governmental agencies and local, active real estate investors. REIA does not permit the sale of products or services, though many REIA Business Members briefly introduce their companies and, often, the savings or other benefits they make available to REIA Members. Real Estate Investor and general business education is also available at Everett REIA, Seattle REIA and Tacoma REIA, all Chapters of the Real Estate Investors Association of Washington, and multiple evening and Saturday classes in Bellevue, Everett, Seattle and Tacoma. Significant networking opportunities with other REIA Members, including Business Members to help build or grow a solid real estate investing team, can be had at every REIA event with even greater opportunities at the REIA Semi-Annual Networking Event and the REIA Master Mind Group Meeting, a small round-table discussion group. 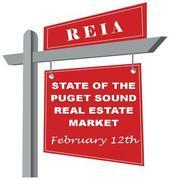 To learn more about REIA, investing in real estate or to register for REIA Events visit www.REIAwa.com or call 425-454-1922 or 1-877-454-REIA (7342).